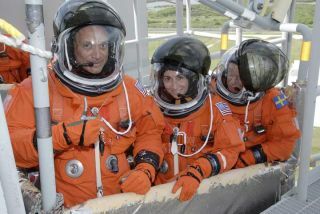 After a successful simulated launch countdown, STS-128 astronauts (from left) Danny Olivas, Nicole Stott and Christer Fuglesang settle in the slidewire basket on NASA Kennedy Space Center's fixed service structure. They are practicing emergency exit from the pad on Aug. 7, 2009. Sevenastronauts climbed aboard NASA?s space shuttle Discovery Friday for a vitaldrill to practice escaping from the spacecraft at the launch pad and go overplans for their late August blast off. Clad inbright orange pressure suits, the astronauts strapped into Discovery at NASA?sseaside Kennedy Space Center in Florida and rehearsed the last few hours beforeliftoff before scurrying out the shuttle?s hatch to a set of baskets designed tozip down a 1,200-foot slide wire away from the launch pad in the eventof an emergency. Theexercise capped a three-day training session to give Discovery?s astronauts somehands-on experience with the spacecraft before their planned Aug. 25 launch tothe International Space Station. ?Everythingwent really well,? NASA spokesperson Candrea Thomas told SPACE.com fromthe Florida spaceport. Commandedby veteran astronaut Rick Sturckow, Discovery?s crew is slated to launch a13-day mission to the InternationalSpace Station to deliver vital supplies, experiments and a treadmill namedafter comedian Stephen Colbert. Three spacewalks are planned during the missionto replace experiments on the station?s European Columbus lab and install a newammonia tank for the outpost?s cooling system. Discoverywill also ferry NASA astronaut Nicole Stott to the space station, where shewill replace fellow spaceflyer Tim Kopra as a member of the outpost?s six-personcrew. Stott joined NASA?s astronaut corps after years working to readyshuttles for flight as an operations engineer at the Kennedy Space Center. ?I?m justthrilled to be able to do it, and I?m looking forward to having it happen,?Stott told reporters of the upcoming flight in a Thursday briefing at thelaunch pad. Friday?slaunch dress rehearsal and escape drill also made an impression on Discovery astronautJose Hernandez, who celebrated his 47th birthday during the training session. ?Great way to spend a b-day!? Hernandez wrote on his Twitterpage. Hernandez is one of several astronauts who will be using themicroblogging site during the shuttle flight. He is posting updates in Englishand Spanish. BeforeDiscovery can launch toward the space station, engineers must close out work toreplace a faulty valve on one of the shuttle?s two solid rocket boosters. Thevalve was replaced this week, with the final clean up work slated to beperformed over the weekend, Thomas said. Engineersare also studying whether modifications will be required for some of the foam-coveredramps on Discovery?s external tank. Somefoam debris popped free from similar so-called ice frost ramps when NASA?sshuttle Endeavour launched toward the space station in July. Engineers havebeen studying the foam loss events to determine what changes, if any, arerequired for future fuel tanks. ?They'redoing some studies and looking into that,? Thomas said. ?Right now we'reprogressing toward launch.? Since theramps in question can?t be reached while Discovery is at the launch pad, if afix is ultimately required the shuttle would have to return NASA?s cavernousVehicle Assembly Building, adding a substantial delay to its mission. Discoveryis currently targeted to launch Aug. 25, but could be ready to fly a dayearlier if preparations continue to go smoothly and no fuel tank fixes arerequired. NASA has until the end of August to launch the shuttle mission beforeit would have to stand down until October due to a flurry of space traffic atthe station. Japan?sfirst unmanned space cargo ship - the H-2 Transfer Vehicle - is slated tolaunch toward the station on Sept. 10. Meanwhile, a Russian Soyuz spacecraftcarrying two new crewmembers and a Canadian space tourist is also set to launchto the station on Sept. 30. Discoverywould likely have to wait until the completion of both those flights if it cannotlaunch by month?s end. The shuttle?sSTS-128 mission will mark NASA?s fourth shuttle flight of the year. NASAshuttle officials plan to review Discovery?s flight readiness next week andmeet on Aug. 18 to officially select the mission?s launch day. Video - Danger on the Launch Pad!